The new Aurieges phono preamplifier is a two-chassis affair with a separate power supply similar to the old Aurieges MM preamplifier. Highlights of the phono version include “RIAA, Columbia and 78 curves and a built-in custom mono step-up transformer and stereo step-up transformers.” Perhaps the perfect compact phono preamp for the omnivorous record collecting music lover. 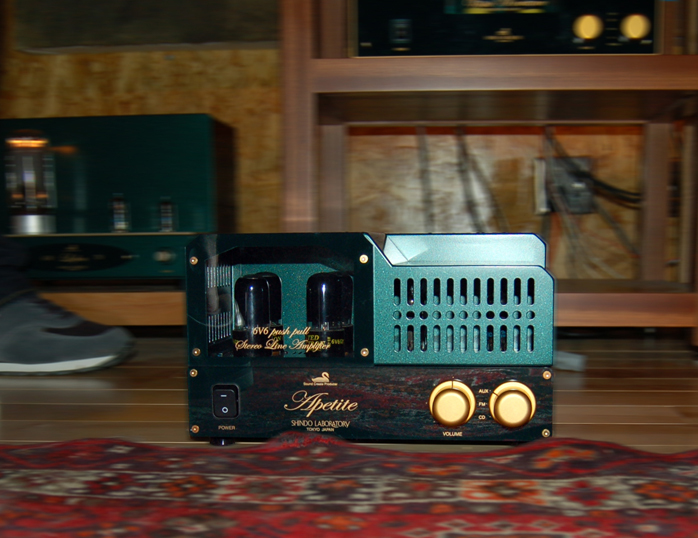 The new Apetite 6V6 push pull integrated amplifier is a bite-sized chunk of green Shindo goodness. Providing three line-level inputs and putting out 15 watts per channel, the Apetite may be the answer for those eyeing Shindo from afar while waiting for a simpler solution involving less wallet-green. Last but not least were the Lafon GM70 monoblock amplifiers, the highest power single-ended amplifiers in the Shindo stable at 20 watts per channel. 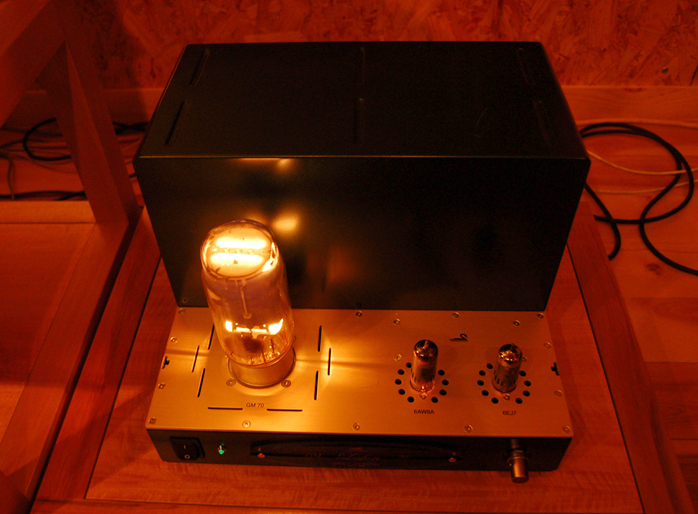 The Russian-made GM70 triode is a transmitter tube similar to the higher profile 211 and 845. The GM70 tube comes in 2 basic flavors – graphite or copper anode. Shindo outfits his amps with the graphite version which will leave some opinionated tube guys wagging their heads in disbelief – “the copper anodes are better”. Having heard both tube types I can say with complete confidence that the graphite version is clearly superior in this amplifier in this system. While the copper version provided more burnish and warmth, the graphite was more incisive, dynamic and overall more musically communicative. I have one question regarding these new products which actually applies to all Shindo Laboratory products – how is it that Ken Shindo makes everything he makes satisfying and delicious? 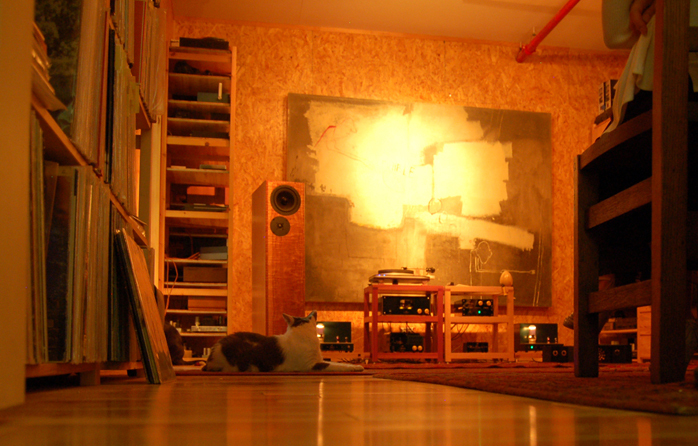 Talk about your audiophile wishes. 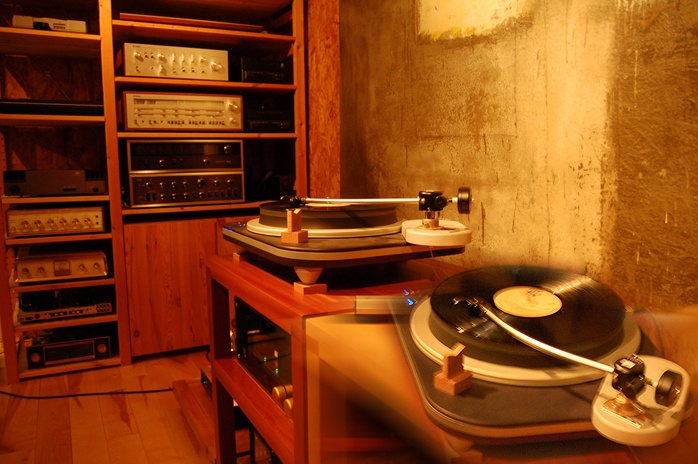 To fill out our system(s) of the evenings, we had the pleasure of listening through the EMT OFD 25i mono cartridge, Shindo SPU, Shindo-modified SPU-A Gold I, EMT 997 banana tonearm and a Spiral Groove TT all sitting on beautiful Box Furniture Co. racks and amp stands. 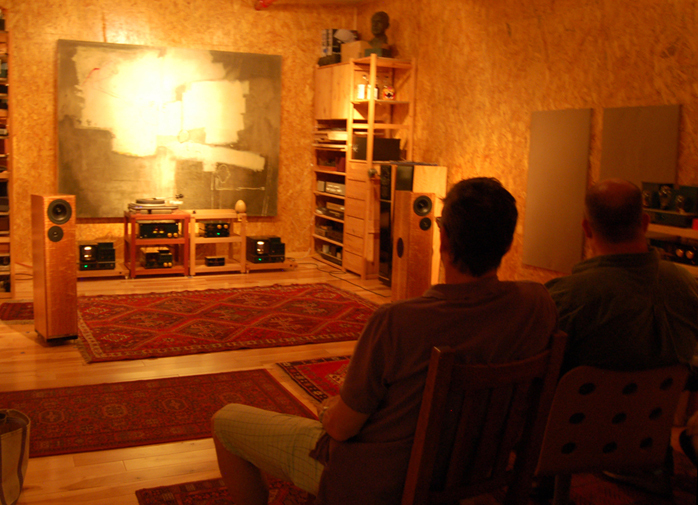 And in a fittingly numeric manner our speaker for all three events was the DeVore Fidelity The Nines. Speaking of The Nines, Stephen Mejias and I were exchanging emails and here’s a comment of his I wanted to share (he said it was okay) because I agree: The Nines have a sound that's as intoxicating and elegant as their physical appearance. I mean, these speakers might just make Chan Marshall ease out of her own alluring awkwardness, sit down on your lucky lap and take a swig from your can of cold Dale's.